One of the biggest changes in maritime safety communications since the invention of radio began to unfold last month. 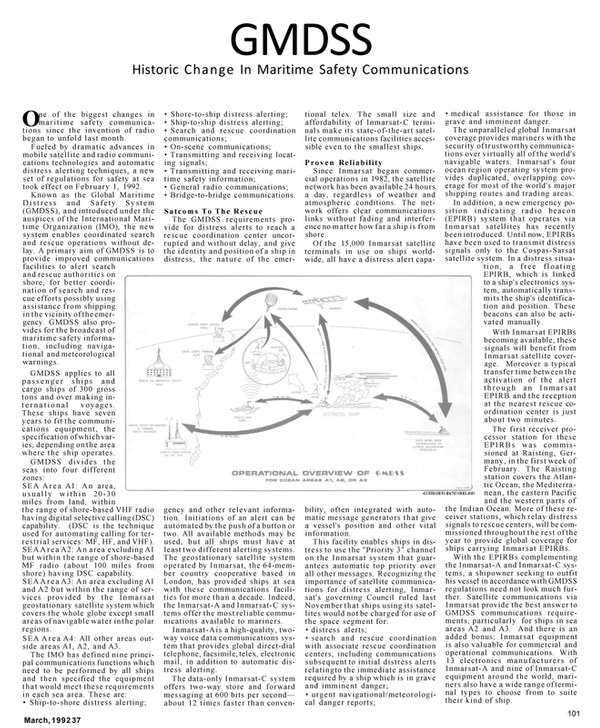 Fueled by dramatic advances in mobile satellite and radio communications technologies and automatic distress alerting techniques, a new set of regulations for safety at sea took effect on February 1, 1992. Known as the Global Maritime D i s t r e s s and Safety System (GMDSS), and introduced under t h e auspices of t h e International Maritime Organization (IMO), the new system enables coordinated search and rescue operations without delay. A primary aim of GMDSS is to provide improved communications facilities to alert search and rescue authorities on shore, for better coordination of search and rescue efforts possibly using assistance from shipping in t h e vicinity of t h e emergency. GMDSS also provides for t h e broadcast of maritime safety information, including navigational and meteorological warnings. GMDSS applies to all p a s s e n g e r ships and cargo ships of 300 gross tons and over making int e r n a t i o n a l voyages. These ships have seven years to fit t h e communications equipment, the specification of which varies, depending on t h e area where t h e ship operates. GMDSS divides the seas into four different zones: SEA A r e a Al: An area, u s u a l l y w i t h i n 20-30 miles from land, within the range of shore-based VHF radio having digital selective calling (DSC) capability. (DSC is the technique used for automating calling for terrestrial services: MF, HF, and VHF). SEA A r e a A2: An area excluding Al but within t h e range of shore-based MF radio (about 100 miles from shore) having DSC capability. SEA A r e a A3: An area excluding Al and A2 but within t h e range of services provided by the Inmarsat geostationary satellite system which covers t h e whole globe except small areas of navigable water in t h e polar regions. SEA A r e a A4: All other areas outside areas Al, A2, and A3. The IMO has defined nine principal communications functions which need to be performed by all ships and then specified the equipment that would meet these requirements in each sea area. These are: • Ship-to-shore distress alerting; • Shore-to-ship distress alerting; • Ship-to-ship distress alerting; • Search and rescue coordination communications; • On-scene communications; • Transmitting and receiving locating signals; • Transmitting and receiving maritime safety information; • General radio communications; • Bridge-to-bridge communications. Satcoms To The Rescue The GMDSS requirements provide for distress alerts to reach a rescue coordination center uncorrupted and without delay, and give the identity and position of a ship in distress, the nature of the emer- gency and other relevant information. Initiations of an alert can be automated by t h e push of a button or two. All available methods may be used, but all ships must have at least two different alerting systems. The geostationary satellite system operated by Inmarsat, the 64-member country cooperative based in London, has provided ships at sea with these communications facilities for more t h a n a decade. Indeed, the Inmarsat-A and Inmarsat-C systems offer t h e most reliable communications available to mariners. Inmarsat-Ais a high-quality, twoway voice data communications system t h a t provides global direct-dial telephone, facsimile, telex, electronic mail, in addition to automatic distress alerting. The data-only Inmarsat-C system offers two-way store and forward messaging at 600 bits per second— about 12 times faster t h a n conventional telex. The small size and affordability of Inmarsat-C terminals make its state-of-the-art satellite communications facilities accessible even to the smallest ships. Proven Reliability Since Inmarsat began commercial operations in 1982, the satellite network has been available 24 hours a day, regardless of weather and atmospheric conditions. The network offers clear communications links without fading and interference no matter how far a ship is from shore. Of the 15,000 Inmarsat satellite terminals in use on ships worldwide, all have a distress alert capability, often integrated with automatic message generators that give a vessel's position and other vital information. This facility enables ships in distress to use t h e "Priority 3" channel on t h e Inmarsat system t h a t guarantees automatic top priority over all other messages. Recognizing the importance of satellite communications for distress alerting, Inmarsat's governing Council ruled last November t h a t ships using its satellites would not be charged for use of the space segment for: • distress alerts; • search and rescue coordination with associate rescue coordination centers, including communications subsequent to initial distress alerts relatingto the immediate assistance required by a ship which is in grave and imminent danger; • urgent navigational/meteorological danger reports; • medical assistance for those in grave and imminent danger. The unparalleled global Inmarsat coverage provides mariners with the security of trustworthy communications over virtually all of t h e world's navigable waters. Inmarsat's four ocean region operating system provides duplicated, overlapping coverage for most of the world's major shipping routes and trading areas. In addition, a new emergency pos i t i on indicating radio beacon (EPIRB) system that operates via Inmarsat satellites has recently been introduced. Until now, EPIRBs have been used to transmit distress signals only to the Cospas-Sarsat satellite system. In a distress situation, a free floating EPIRB, which is linked to a ship's electronics system, automatically transmits t h e ship's identification and position. These beacons can also be activated manually. With Inmarsat EPIRBs becoming available, these signals will benefit from Inmarsat satellite coverage. Moreover a typical transfer time between the activation of the alert t h r o u g h an Inmarsat EPIRB and t h e reception at the nearest rescue coordination center is just about two minutes. The first receiver processor station for these EPIRBs was commissioned at Raisting, Germany, in t h e first week of February. The Raisting station covers the Atlantic Ocean, t h e Mediterranean, the eastern Pacific and the western parts of the Indian Ocean. More of these receiver stations, which relay distress signals to rescue centers, will be commissioned throughout t h e rest of t h e year to provide global coverage for ships carrying Inmarsat EPIRBs. With the EPIRBs complementing the Inmarsat-A and Inmarsat-C systems, a shipowner seeking to outfit his vessel in accordance with GMDSS regulations need not look much further. Satellite communications via Inmarsat provide the best answer to GMDSS communications requirements, particularly for ships in sea areas A2 and A3. And there is an added bonus; Inmarsat equipment is also valuable for commercial and operational communications. With 13 electronics manufacturers of Inmarsat-A and nine of Inmarsat-C equipment around the world, mariners also have a wide range of terminal types to choose from to suite their kind of ship.